The federal government spends a disproportionate amount of its budget for outside contractors in the final month of the fiscal year, as agencies rush to blow through cash before it’s too late. 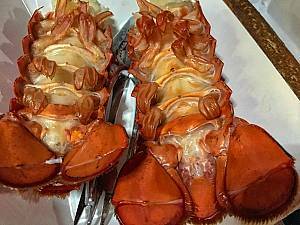 Among the more noteworthy expenditures in 2018, according to the watchdog group Open the Books, was $4.6 million for lobster tail and crab. Of that $544.1 billion, almost $97 billion was spent in September 2018, the final month of the fiscal year, including $53.3 billion in the final seven days of the month. That’s compared to $47 billion spent in the entire month of August. As the fiscal year came crashing to an end, bureaucrats apparently did their best to spend as much money as quickly as possible. A whopping $490 million went to furniture, including a baffling $9,341 for a Wexford office chair. Agencies also spent $49,515 for skis and ski poles, $11,816 for a foosball table, and $258,901 on pianos. Mutant Ninja Lobsters DARPA's latest invention. Maybe we could use the Pentagon's excess of lobster armor as materials to build the wall? There may be a lot of jobs Americans won't do but I bet you could hire some guys from the Lowe's parking lot that would be happy to do the job much cheaper than Boeing or Raytheon.